Here's a cornucopia of ideas for repurposing your vegan holiday leftovers. We all know leftovers are one of the great things about Thanksgiving, and those of us enjoying a full vegan meal tomorrow are, if anything, more excited than most about the distinctive fall flavors we’ll get to savor throughout this holiday weekend. But in order to do so, experienced vegans know to plan ahead. 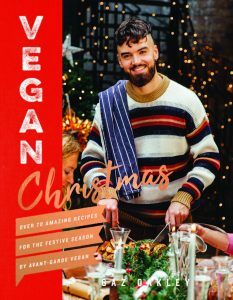 Recipe from “Vegan Christmas” by Gaz Oakley. Heat the oil or water in a large saucepan placed over a medium heat. When it is hot, add the leeks and garlic and sauté for 3-4 minutes until soft. Add the sweetcorn and “turkey” (or veg), stir with a wooden spoon, and cook for a further 3 minutes. A little caramelization on the turkey will add a great flavour. Add the seasoning, then pour in the wine or stock, scraping any bits off the bottom to deglaze the pan. Cook for a further 3 minutes. Stir in the cream and miso paste and simmer gently for 15 minutes – don’t let it boil. After 15 minutes, it should be nice and creamy. Check the seasoning, and add more if needed. 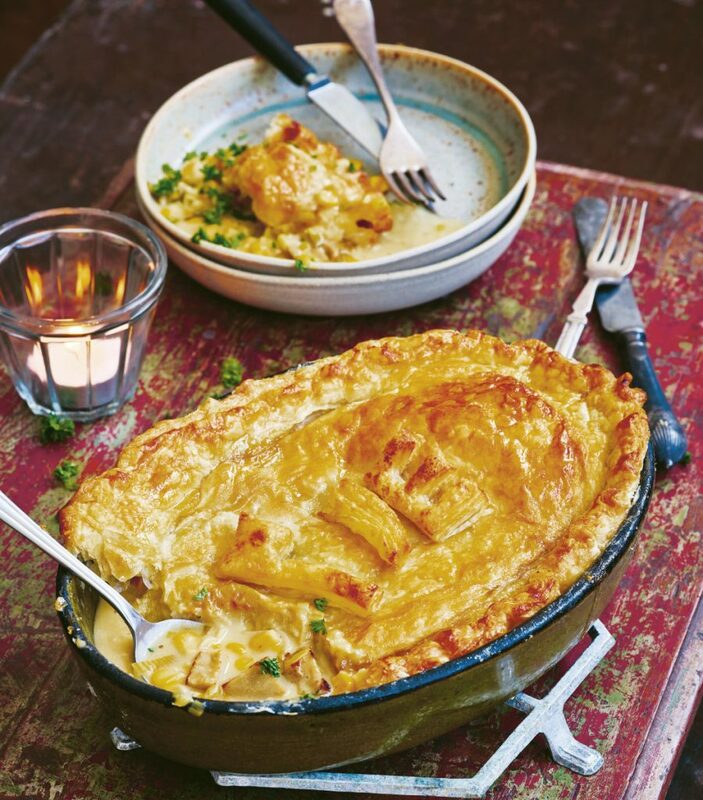 Scrape the filling into a 23cm (9in) pie dish and leave it to cool for around 25 minutes. Meanwhile, preheat your oven to 180ºC (350º). Lightly flour a clean work surface and roll out your pastry to around 4mm (1/6-inch) thick and wide enough to fit over your pie dish. Carefully transfer the pastry and lay it over the cooled filling, gently pressing around the edges of the pie dish to seal and trim off any overhanging pastry. Pinch the pastry around the edge of the pie dish to create a fluted edge. Get creative with the pastry trimmings – roll out again and cut into festive shapes or letters to decorate your pie, brushing with milk. Mix the glaze ingredients together in a small bowl, then brush the glaze over the pie top and decoration. Bake on the lower shelf of the preheated oven for 30 minutes until the pastry is beautiful and golden. Brush with a little more glaze just before serving if you like. “I make multiple batches of everything so that we can enjoy it for days after,” said Nancy Eaton of Bethel. Her vegan Thanksgiving menu includes a roast she makes with tofu and fills with stuffing, and serves alongside mashed potatoes, butternut squash, turnips and vegan gravy. She’s also hoping for leftover vegan cheesecake and pumpkin pie. Vegan dishes tend to be popular at my Thanksgiving, so I always roast a double batch of pumpkin seed croquettes to ensure leftovers. I also like to make extra cranberry sauce, vegan gravy, mashed potatoes and pie – all holiday foods I want to enjoy more than once. Maine native Kelly Caiazzo, who grew up in Gorham and now lives in Wellesley, Massachusetts, told me one of the hurdles on the way to vegan leftovers is the small size of store-bought vegan roasts. “My family of four will eat an entire Field Roast Celebration Roast on Thanksgiving,” Caiazzo said, leaving nothing for the next day if they only make one. Anyone keen to make a vegan turkey sandwich after Thanksgiving must either cook an extra plant-based roast (or two) or stock the refrigerator with vegan turkey slices. Kacie Simpson of Lewiston buys Tofurky deli slices ahead of the holiday, and then after Thanksgiving she uses the vegan lunch meat in submarine rolls along with leftover mashed potatoes, stuffing, cranberry sauce and gravy. She warms the subs in the oven before serving the sandwiches. At Bethany Mulkern’s house in Old Orchard Beach, it is slices of leftover lentil loaf that fill day-after-Thanksgiving sandwiches. She fries each slice in a skillet and then places it between sturdy bread with vegan mayo and cranberry sauce. Chef Tony DiPhillipo takes a similar tack at his Portland home. Using vegan wonton wrappers, Heather Dexter of Windham makes mini Thanksgiving egg rolls. “On a flat wonton wrapper,” Dexter said, “I put cold mashed potatoes, cold stuffing, cold vegan turkey” and cranberry sauce. She shapes them to resemble tiny egg rolls, deep fries the rolls until golden brown and crispy, and serves them with warm vegan gravy for dipping. She puts the same filling in hand pies, made with pastry dough and baked rather than fried. Ashley Carter of Franklin takes extra vegan stuffing, oils up her waffle iron and makes stuffing waffles. She warms leftover gravy and cranberry sauce to top the savory meal. With multiple vegan family members, Mary Giknis of Kennebunkport has invented new plant-based customs to replace older animal-based traditions at the Thanksgiving she hosts. One of her favorite additions is a turkey she sculpts from fruits and vegetables. “I just copy something from Pinterest,” Giknis said of her inspiration. She uses it to brighten the Thanksgiving table, then, the leftover fruit becomes the next day’s smoothie and the leftover vegetables are either roasted or turned into soup for an easy lunch or dinner. Caiazzo, whose family eats all the vegan roast on Thanksgiving, looks forward to leftovers of her favorite vegan green bean casserole, made from the recipe in Isa Chandra Moskowitz’ “The Superfun Times Vegan Holiday Cookbook.” She also likes to transform leftover sweet potatoes and cranberry sauce into vegan cookbook author and blogger Kathy Patalsky’s recipe for Sweet’n Sassy sweet potato pockets. I fry my mashed potato pancakes until they develop a golden brown crust on each side, which takes some careful watching, a spatula with a beveled edge and roughly 3 to 4 minutes per side. After I’ve put about 1 cup of mashed potatoes on a hot and lightly oiled cast iron frying pan, I add a spoonful or 2 of frozen peas to the top and then sprinkle generously with curry powder. I press both into the potatoes, and then when I flip the pancake the peas steam next to the heat source and I sprinkle more curry powder on the other side. I serve the pancakes with a liberal drizzle of Thirty Acre Farm’s Red Riot hot sauce. Carlie Knight of Friendship may use one of the simplest techniques for repurposing leftovers. She takes leftover vegetables such as roasted potatoes, carrots, squash and onions and sautés them into a Thanksgiving hash, which she serves with stuffing and cranberry sauce.